I’m afraid I abandoned this autobiography, and I’m rather ashamed to admit that. 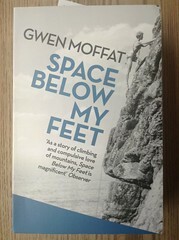 I feel that I ought to have relished reading about the life and achievements of Gwen Moffat (still going strong at 93), who made a living from climbing and writing from the 1940s onwards, becoming the first female British mountain guide in 1953, and wrangling marriage and motherhood alongside it all. But I gave up after Boats and Babies.